Raspberry or red raspberry is the common term for the plant Rubus idaeus in the rose family (Rosaceae). The term is also applied to the edible fruit of this plant, which is a tart, sweet, red composite fruit that in proper botanical language is not a berry at all, but instead an aggregate fruit of numerous drupelets around a central core. In raspberries and other species of the subgenus Idaeobatus, the drupelets separate from the core when picked, leaving a hollow fruit, whereas in blackberries the drupelets stay attached to the core. The term raspberry is not restricted only to Rubus idaeus but is also applied to a number of other shrubby, prickly plants in the Rubus genus. These include the black raspberry or blackcap (Rubus occidentalis), Arctic raspberry (Rubus arcticus), flowering raspberry (Rubus odoratus), wine raspberry (Rubus phoenicolasius), whitebark raspberry or western raspberry (Rubus leucodermis), bramble raspberry or blackberry (Rubus fruticosus), Korean raspberry (Rubus crataegifolius), and mysore raspberry or hill raspberry (Rubus niveus). Not all of these are included in the same subgenus of Idaeobatus. Only Rubus idaeus is considered in this article. Rubus idaeus is sometimes called the European red raspberry to distinguish it from R. strigosus, which is called the American red raspberry. However, many taxonomists consider these the same species, with the American red raspberry as a subspecies or variety of R. idaeus. The flower and fruit of the raspberry, which are important for the raspberry's individual purpose of reproduction, also provide larger values for the ecosystem and for human beings. Ecologically, the raspberry flower is a nectar source for honeybees, and the fruit is consumed by numerous animals. For humans, the fruit is popular not only for its pleasing taste, color, and texture, but also offers nutritional and medicinal values. It sometimes has been called a "women's herb" for its aid to women during pregnancy and with their menstrual cycles, but it also has been used to address gastrointestinal disorders and mouth and throat sores, and has been considered helpful in preventing cancer and assisting people with diabetes (Longe, 2005). Rubus is a genus of plant in the family Rosaceae. Rosaceae is one of the largest families of flowering plants with about 3,400 species, including apples, berries, peaches, plums, cherries, the hawthorn tree, the mountain ash, and many others. Plants in the Rubus genus have prickles like roses and are often called brambles; this name is most often used for the blackberry and similar fruits that are also of rambling habit, and not used for those like the raspberry that grow as upright canes. The fruit of Rubus plants is called bramble fruit and is an aggregate of drupelets. The genus Rubus is a very complex one, containing 13 subgenera. There are over three hundred known species in the genus Rubus, of which several have the name raspberry as part of their name. However, the term raspberry by itself is most often used with respect to Rubus idaeus or its edible fruit. Raspberry (Rubus ideaeus) is a deciduous bush that reaches six feet (two meters) in height, and stands erect with thorny stems; its roots are perennial (Longe, 2005). Leaves are found in groups of three or five and the undersides are silver-white in color. Blackberries have similar looking leaves but the undersides are green. The flowers, which are white, bloom in late spring or early summer, and the fruit is red and spherical and grows on the branches (Longe, 2005). The "berry" is composed of many connected druplets, which are individual sections of fruit, each with its own seed (Herbst, 2001). This berry surrounds a central core, which separates from the berry when picked. Rubus ideaeus typically grows in forest clearings or fields, particularly where fire or wood-cutting has produced open space for colonization by this opportunistic colonizer of disturbed soil. The raspberry flower can be a major nectar source for honeybees. As a cultivated plant in moist temperate regions, it is easy to grow and has a tendency to spread unless cut back. Two general types of Rubus ideasus are commercially available: the wild-type summer bearing, which produces an abundance of fruit on second-year canes within a relatively short period in midsummer, and double- or "ever"-bearing plants, which also bear a few fruit on first-year canes in the autumn, as well as the summer crop on second-year canes. In the United States, raspberries can be cultivated from USDA plant hardiness zones three to nine. There are many varieties that have been developed. Raspberries are a popular fruit that are considered by many the most intensely flavored berry (Herbst, 2001). They are eaten as is, made into jam, and used for flavoring many items. They have high concentrations of tannin, and a fair amount of iron, potassium, magnesium, calcium, and vitamins A and C, as well as flavonoids, pectic, fruit sugar, and water (Herbst, 2001; Longe, 2005). Raspberries contain significant amounts of polyphenol antioxidants, chemicals linked to promoting endothelial and cardiovascular health. Xylitol, a sugar alcohol alternative sweetener, can be extracted from raspberries. Raspberries are considered a high-fiber food at over eight grams of dietary fiber per cup. Raspberries are used in alternative medicine, particularly to aid women in pregnancy. A tea made from the leaves has been used for centuries to assist pregnancy (helping alleviate morning sickness, preventing miscarriage, strengthening the uterus, regulating contractions, and relaxing the uterus) and to increase breast milk after the birth of the baby (Longe, 2005). Some women use it to regulate menstrual cycles and decrease heavy menstrual flow (Longe, 2005). A 1941 study confirmed that it works as a uterine relaxant (Longe, 2005). Raspberries have also been used medicinally to address gastrointestinal disorders, mouth and throat sores, and they have been considered helpful to prevent cancer and assist people with diabetes (Longe, 2005). Leaves of the raspberry cane are used fresh or dried in herbal and medicinal teas. Wilted raspberry leaves, however, develop a mild poison that may make people ill (Longe, 2005). As an astringent (a chemical substance that tends to shrink or constrict body tissues), raspberry is a gentle antidiarrheal and also is used to reduce nausea and vomiting (Longe, 2005). It has been used to heal mouth and throat sores, and for bleeding gums and oral inflammations (Longe, 2005). Raspberries are grown for two reasons: for the fresh market and for commercial processing. Traditionally raspberries were a late summer crop, but with new technology, varieties, and innovations, raspberries can be enjoyed all year-round. Raspberries need a lot of sun and ample amounts of water in order to develop to their fullest. Escaped raspberries frequently appear as garden weeds, spread by seeds found in the excrement of birds. Raspberries are normally started in the winter from dormant canes. In private gardens, these typically are planted about three feet apart in fertile, well drained soil. The soil is prepared beforehand by digging deeply and incorporating plenty of organic matter, such as compost. In the first year, the removal of all flowers will allow the plant to build up reserves and to grow bigger. From the second year, the previous year's canes will flower in the spring and the fruit will ripen in the summer. The canes should be watered and fed well in the spring and summer, but by decreasing water and food in the autumn they can be hardened to survive the winter. In the winter, old flowered canes should be pruned down to the ground level. Of the new canes, all small and weak ones should be removed, as well as those that are growing too close to each other, allowing 10-15 centimeters between canes. Most varieties will need to be staked. Raspberries are very vigorous and can be a little invasive. They propagate using basal shoots (also known as suckers), which are extended underground shoots that develop roots and individual plants. They can sucker new canes some distance from the main plant. For this reason, raspberries spread well, and can take over gardens if left unchecked. Pushing a spade straight down at the boundary of the plant will sever the suckers, which can then be dug out when outside the boundary. Recent breeding has resulted in varieties that are thornless and upright (do not require staking). 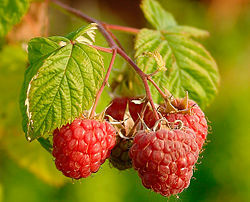 Raspberries also have been crossed with other members of the Rubus genus, resulting in a number of hybrids, such as boysenberry and loganberry. A gold raspberry, which is pale yellow, has been selected by horticulturists. Red, purple, black, and albino raspberries. Black Raspberry - The underside of a raspberry leaf is silver-white. First year raspberry canes are larger and have no fruit. Poison Ivy berries look nothing like raspberries. Single raspberry on a bush. Henderson, C.W. “Red Raspberries May Help Fight Cancer.” Cancer Weekly Plus. January 18, 1999. Herbst, S.T. The New Food Lover's Companion: Comprehensive Definitions of Nearly 6,000 Food, Drink, and Culinary Terms. Barron's Cooking Guide. Hauppauge, NY: Barron's Educational Series. 2001. ISBN 0764112589. Longe, J.L. The Gale Encyclopedia of Alternative Medicine. Farmington Hills, MI: Thomson/Gale. 2005. ISBN 0787693960. This page was last modified on 7 May 2008, at 02:04.